The martyrdom of Saint Stephen, his appearance before the High Priest and the false accusation with which he was denounced are all recounted in The Acts of the Apostles. The New Testament account provides various details about this saint’s death. Thus we know that he was taken out of the city and stoned, that witnesses left their cloaks at the feet of a young man named Saul (Saint Paul), who was in favour of his death, and that Stephen prayed as he was being stoned. 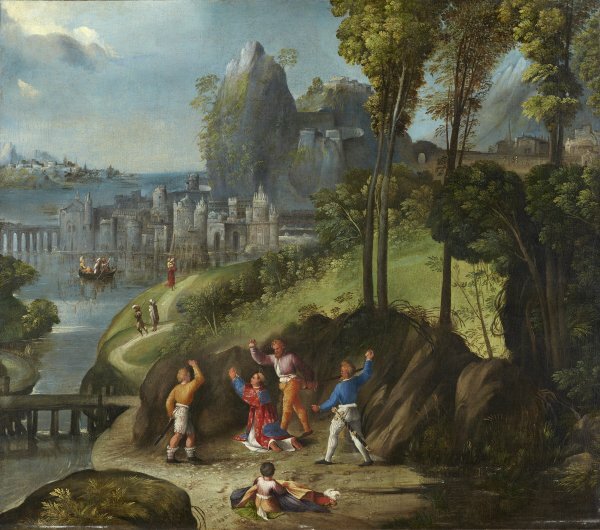 The narrative of the present painting follows the biblical account: the scene takes place on the outskirts of Jerusalem. Saint Stephen, surrounded by his executioners, is kneeling in prayer while a young man with some cloaks who can be identified as Saul is to be seen in front of the group, seated on the ground. Stephen, who can be recognised by his deacon’s dalmatic, was the first Christian martyr. Since it was first published by Roberto Longhi in 1934 this painting has been attributed to both Dosso and Battista Dossi, or has been considered a collaborative work, as Felton Gibbons suggested in his 1968 monograph. The similar style of the two brothers as well as the fact that they worked together has frequently made it difficult to tell their work apart. Various interesting aspects of this canvas have been pointed out. Longhi, for example, noted the influence of Raphael and Giulio Romano on the figures of the executioners and the influence of Flemish art, particularly that of Patinir, in the landscape. Gibbons analysed the figures, which are small in comparison to the setting. He considered them to be by Battista, while the landscape is by Dosso. 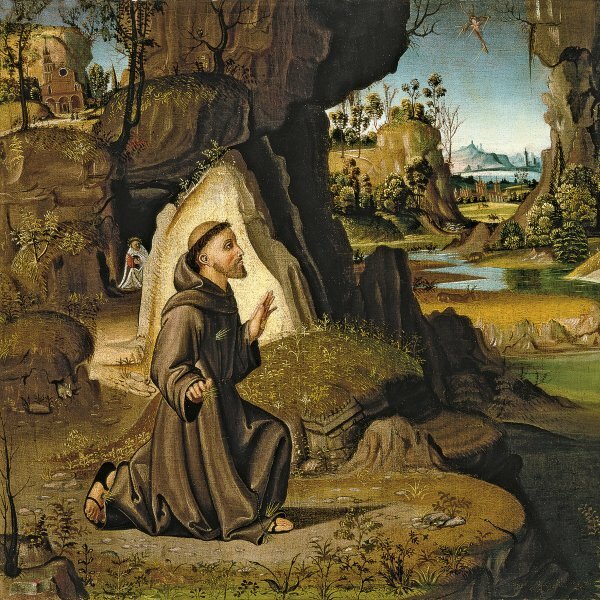 The influence of Flemish art in the background and the importance given to the natural setting are also features of other works by Dosso, such as Landscape with Saints in the Pushkin Museum, Moscow. In Alessandro Ballarin’s text and in the monographic exhibition on Dosso Dossi, the painting was published as a work by Battista. In his commentary of 1988, however, David Ekserdjian considered it to be by Dosso. This canvas was formerly in the Gottschewski collection in Berlin. In the 1960s it was in Hamburg in the Ruth Nottebohm collection, passing from there to the US where it was on the art market in 1968. It was acquired for the Thyssen-Bornemisza collection from a New York gallery in 1973. Attempts have been made to identify this canvas with a work of the same subject by Dosso Dossi that is recorded in the inventory of Alessandro d’Este in 1624. It has also been suggested that it might have belonged to the collection of Cardinal Ludovico Ludovisi, appearing in the 1623 and 1633 inventories, and to the Falconieri collection in Rome. The vagueness of the descriptions in these inventories, however, makes it extremely difficult to be certain.